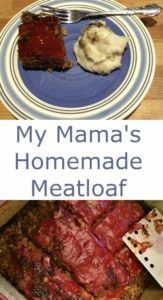 I grew up thinking my mama made the best meatloaf. She didn’t measure; she just dumped and added ingredients until they looked right. One day in exasperation, I stood beside her and measured before I allowed her to dump so I could get her recipe. Some time later, she put her recipe into her hand-written notebook. When hamburger is on sale, I buy it in bulk. Then I come home and mix up two or three of these meatloaves. I put one in the oven that day and the rest in the freezer in a zip-lock bag that has the mixture smashed pretty flat and labeled. When I’m going to have a busy day, I get that bag out of the freezer in the morning and let it thaw. By late afternoon, it’s ready to go into the oven and I’ve not spent any time in the kitchen. I came home from town the other day knowing I’d be having a late lunch when I got home. 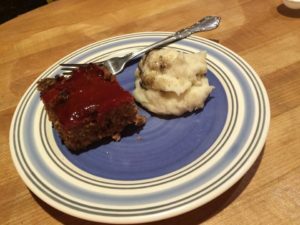 All the way home, I was thinking about that one last piece of meatloaf with some mashed potatoes and browned butter. It was going to be my lunch. 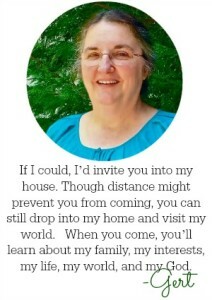 Yet when I got home and started rifling through the refrigerator, I couldn’t find that container. So I checked the sink. Yep. There it was, completely empty. Dave had come in mid-morning and cleaned it up. You know what a disappointment it is when you’ve been looking forward to sinking your teeth into that favorite dish only to find it already gone? Yep. I had a huge dose of that. 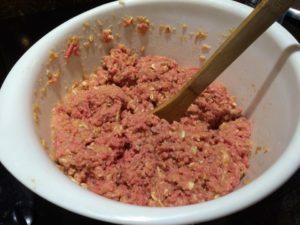 To make this recipe, you’ll need hamburger, milk, eggs, oatmeal, tomato juice, and crushed corn flakes. If you like onion or other seasonings, add them to suit your fancy. Just mix it all together and put it into a pan. This photo shows homemade mashed potatoes with browned butter on the top. That was also one of my mama’s specialties. You can serve this with scalloped potatoes or with creamy, cheesy macaroni or with baked macaroni. 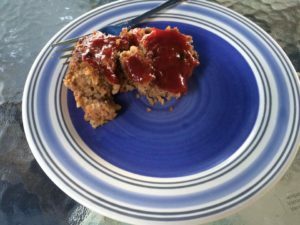 I also like to serve this meatloaf with home fried potatoes. 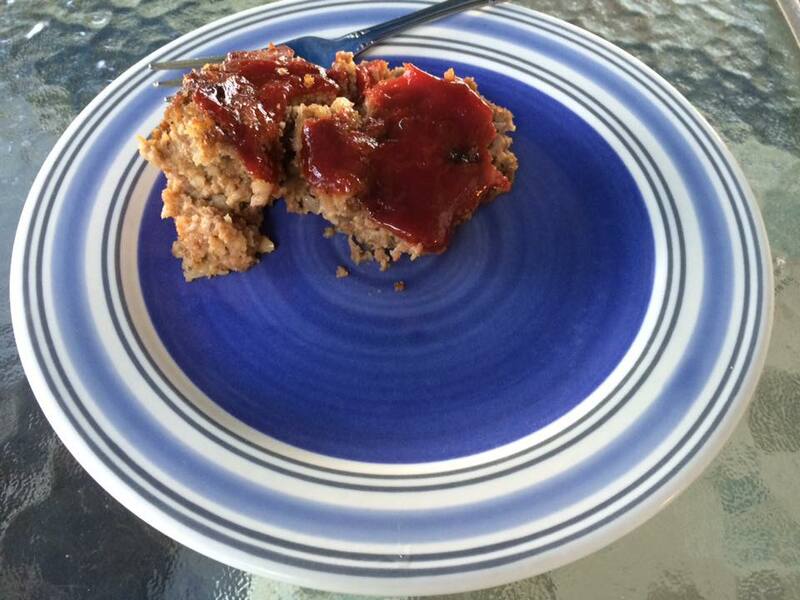 A simple, hearty recipe for homemade meatloaf that will have you coming back for more. Put into a 9 x 12-inch pan. Bake at 250 for 2 hours OR at 350 for 1+ hour. You can top with ketchup after the first hour. Heat in oven at 350 until it begins to cook. Turn off oven and set time-bake for 11 o'clock at a temperature of 250.